The National Assembly is set to open a plenary session Friday evening to vote on a revised government budget for 2019, having postponed the vote in a bid to get minor parties to participate. The three minor parties vehemently oppose larger parties’ decision to put it to a vote, as they had sought to link the budget bill passage to the introduction of a new proportional representation system. The ruling Democratic Party and the main opposition Liberty Korea Party agreed Thursday to cut some 5.2 trillion won ($4.7 billion) from the government’s record 470.5 trillion-won budget bill. Next year’s budget plan is aimed at boosting the slowing economy and spurring job creation, as well as supporting inter-Korean projects. The three minor parties -- the center-right Bareunmirae Party, center-left Party for Democracy and Peace, and progressive Justice Party -- strongly condemned the agreement by the two major parties, as it did not contain commitment to electoral reform that they have been demanding. 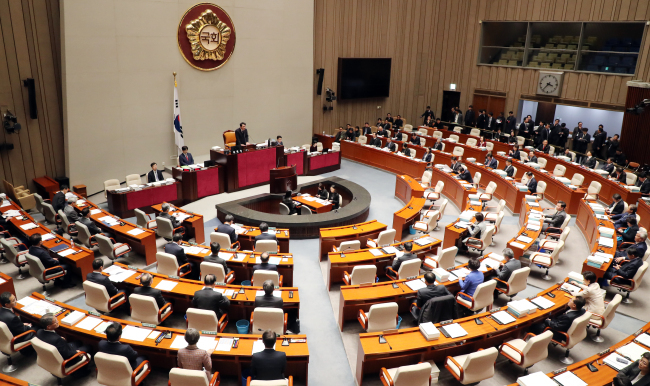 The Democratic Party and the Liberty Korea Party rejected the proposal, claiming the issue should be discussed separately from the budget. About 190 other bills are to be voted on during the session. The minor parties are expected to boycott the plenary session that was rescheduled twice Friday to convene at 7 p.m. It would be the last plenary session to take place before the parliament’s regular session ends Sunday. Sohn Hak-kyu, head of the Bareunmirae Party, and Lee Jeong-mi, the chairwoman of the Justice Party, went on hunger strike Thursday to protest the move. “The two parties with vested interests have formed a coalition to reject our election reform proposal,” Sohn said, sitting inside the National Assembly on Friday. When the floor leader of the ruling party, Rep. Hong Young-pyo visited, Sohn explained that they had to try to link the election reform issue to the budget bill because they lack power as minor political bodies. “Electoral reform should go in tandem with the budget proposal passage. I will fast until those go together, and if not, I will devote my life for democracy at this hall of the National Assembly,” he added. The minor parties are pushing for the introduction of a mixed-member proportional representation system in which parliamentary seats are tied to the percentage of voters’ support for different parties. This year’s budget review did not go smoothly, with partisan wrangling going on past the legal deadline for its passage Sunday, although budget deadlines have often been missed in recent years. The major points of contention in the original budget bill were an expected 4 trillion-won shortfall in tax revenue that stemming from tax cuts and the budgets allocated for inter-Korean projects and job creation. Under Thursday’s agreement, the two major parties agreed to cut some spending on job creation and inter-Korean cooperation projects and reduce the number of newly hired public servants by some 3,000. Opposition parties took issue with 1.1 trillion won set aside for inter-Korean projects and a record 23.5 trillion won earmarked for job creation. The two main parties, meanwhile, decided to increase spending on measures to tackle the low birthrate and ways to build social infrastructure. They also said that the government should repay debt in advance within this year to fill the 4 trillion-won shortfall in tax revenue. For next year, state bond sales will be limited to 1.8 trillion won. In 2014, the National Assembly barely made the legal deadline for the budget’s passage but has failed to meet it every year since then, missing the deadline by one day in 2015 and 2016 and by four days last year.